We’ve got the best customers and we’re going to prove it. Send us an email to tell us what you’re up to and we’ll post it on our blog. Pictures too! 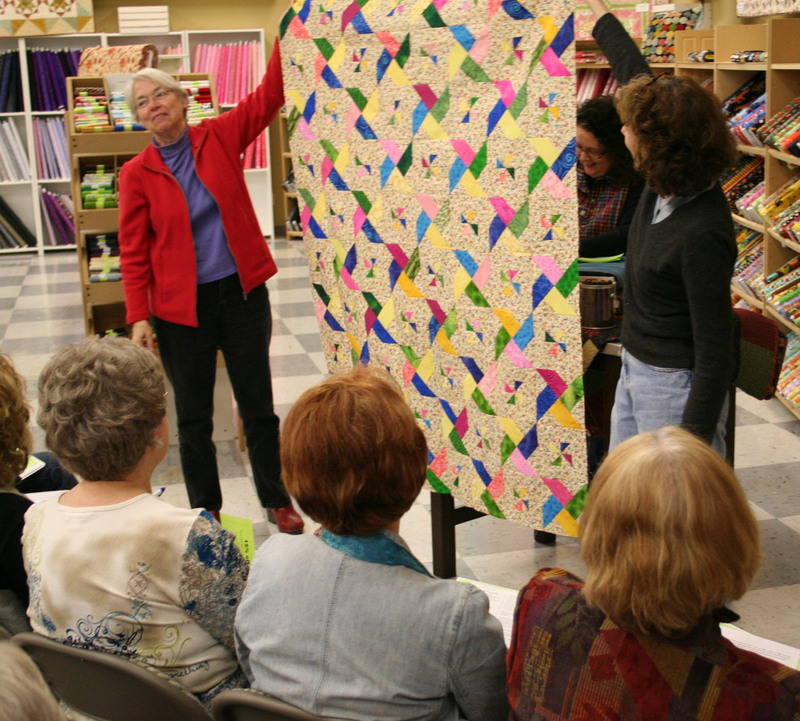 When you work at a quilt store, your customers become like family. They share with you the projects they are working on, tell the stories behind the quilts, and you learn when and why they started quilting. 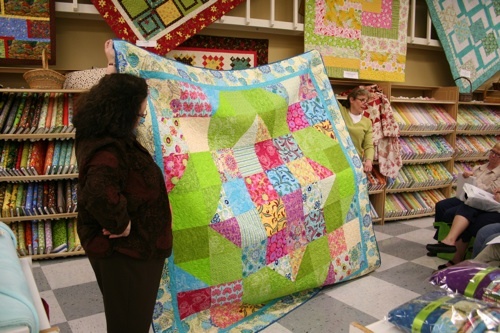 The employees at Quilt Expressions are often asked for their opinion on which quilt pattern to use, help finding fabrics that work best together and help determine which quilting design will work best with the quilt top. 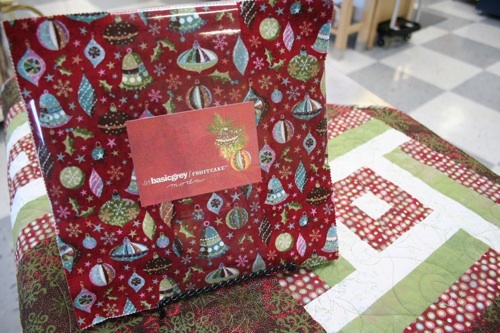 We have the honor of admiring their finished projects before they are wrapped up for gift giving. This morning, we had the privilege of recognizing a milestone with one of our friends, Phyllis. Phyllis is a familiar face at Quilt Expressions, spending the majority of her time on the long arm side of the store. New customers often take a peek at what our long arm customers are working on, and Phyllis always greets them with a smile and is willing to answer any questions they might have. Like many of us, Phyllis started sewing when she was in the seventh grade in her school’s Home Economics class. As an adult, she sewed most of her three daughters’ clothes and created handcrafted gifts from the scraps. 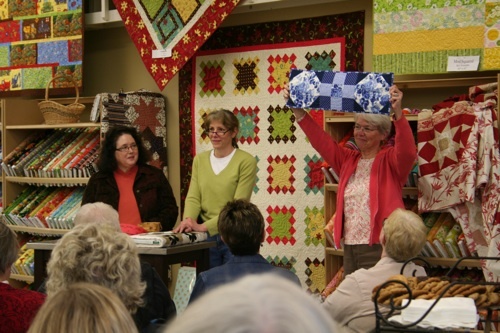 In 2008, after retiring, she was able to dedicate more of her time to making quilt tops. She sent a couple of tops in to Quilt Expressions for us to quilt. In 2012, her daughter gave her a gift certificate and told her that it was to be used for our long arm class. 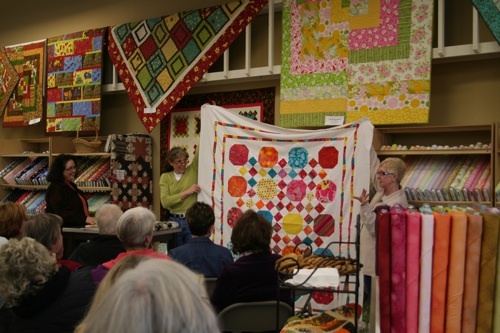 Phyllis took the class in August 2012 and came in to quilt her first quilt top one month later. 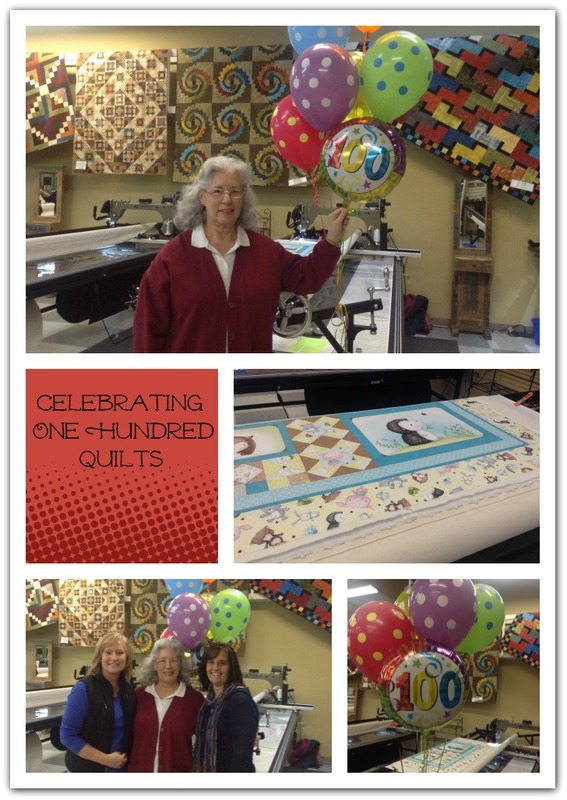 Today, 26 months after taking the class, she quilted her 100th quilt. That in itself is an accomplishment. However, what makes her story so inspiring is what she does with her quilts. 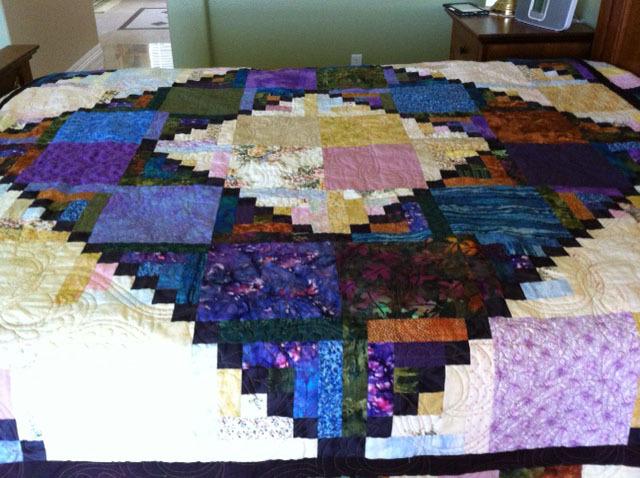 Most of her quilts are either donated or given away as gifts. 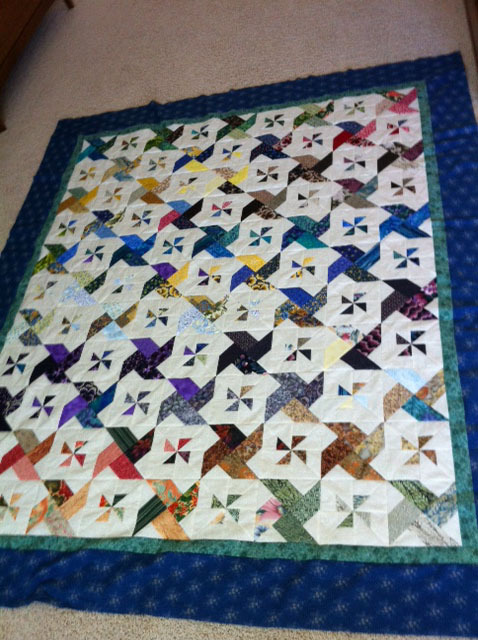 Last year, Phyllis donated 45 quilts, and she already has 25 completed quilts in her donate pile for 2015. Donating quilts to those in need is an endeavor that is dear to Phyllis’ heart. When her daughter was just twenty five years old, she was diagnosed with cancer. She was treated by and later passed away at St. Luke’s Children’s hospital. A good majority of the quilts that Phyllis donates are to the hospital. She makes lap-sized quilts for the older boys and girls, from 9 – 23 years of age. As she makes each one, she thinks of her daughter. Sewn into each quilt is the generosity and care of a mother’s love, with the hope that the recipient will find comfort beneath it’s folds. Thank you, Phyllis, for your inspiring spirit of giving. Our next year of StashBusters is starting up in February. We’re kicking off the new year with a big, bold quilt. The best part? It only takes six one-yards cuts to piece the top. How easy is it to put six fabrics together? Big blocks are in right now and this quilt is perfect for showing off those bold prints you’ve been stowing away in your stash for just the right project. When you join StashBusters, you’ll be the first to receive this all-new pattern. If you haven’t been a part of StashBusters in years past, here’s the low-down on our popular year-long pattern club. We meet the fourth Wednesday of the month at 6:00 p.m., or the following Saturday at 11:00 a.m. Each month you will be among the first to receive our latest original Quilt Expressions pattern. Each scrappy pattern is designed to go together quickly and use up the piles of fabric you have hiding in your sewing rooms (don’t deny it!) We give away door prizes at each meeting and you’ll have an opportunity to show-and-tell quilts you’ve made from our StashBusters patterns. At the end of the year, we’ll top it all off with an auction extravaganza. Our first meeting will be on Saturday, February 23rd, at 11:00 a.m. or Wednesday, February 27th, at 6:00 p.m. (Did we mess you up? Our first meeting dates are different than the usual fourth Wednesday and following Saturday to account for the short month.) Call or come in to the shop to sign up. Cost is $50 for newcomers, which includes a 3-ring binder to house all your StashBusters patterns, and $45 for returning members. Let the party begin! Do you live outside the Boise area? Don’t despair. We have a StashBusters group for all our “global” members – you’ll get your patterns mailed to you every month. You can join at any time. For more information, continue on to our website. The votes are in and we have a winner. Make that TWO winners! We had so many entries to our Five Easy Pieces Contest that we couldn’t pick just one. Congrats to Maren Ou Yang and Sandy Fisher for their excellent choices. 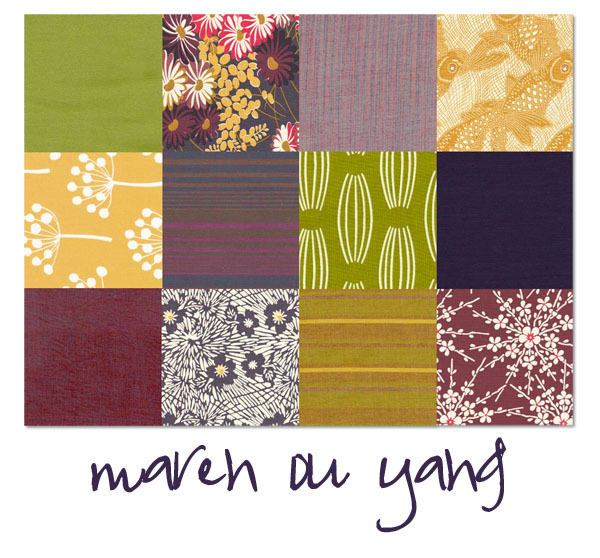 We love the color palettes they created, and their ability to weave a great variety of fabrics together. They pulled from a range of collections and designers. Great job! 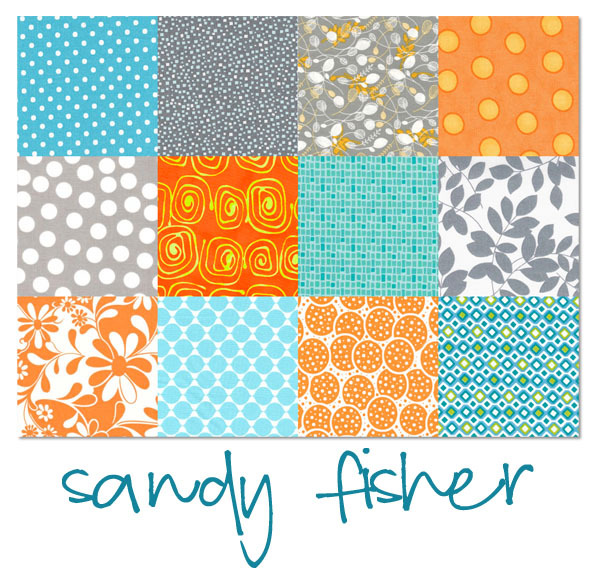 Maren and Sandy each received the twelve fat quarters they submitted to our wishlist contest, as well as our popular Five Easy Pieces pattern. Like what you see? We will be making kits from their choices in the near future. One of the best parts of quilting is playing with color. Color is intoxicating — it’s hard to not be happy when I show up to work every day surrounded by a vibrant rainbow. And one of the most challenging, but rewarding, hurdles to quilting is mastering your eye for color. Some of us are naturals (like Karen!) and some of us need a little coaching. A good place to start is Jean Wells’ Intuitive Color & Design. It gives you an in-depth guide for selecting fabric combinations that will really make your quilts unique and pleasing to the eye. On top of being a fun thing to do, Pinterest is a great way for us to connect with you and see all your fantastic ideas. So we’re creating a little challenge to get you in on the fun. We’ve created a Color Challenge: Chartreuse + Grey + White board with an initial inspiration photo to get you started. The idea is to find fabrics and other photos that tell that same color story. 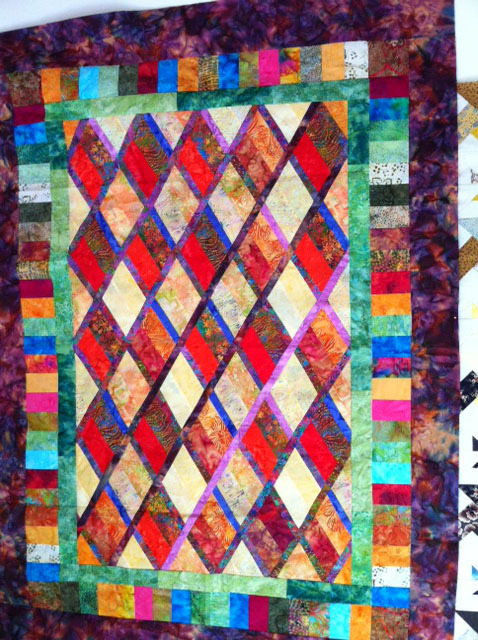 If you were ambitious, you could ultimately make a quilt that captures the same feeling. We will be doing more color story challenges in the future, so stay tuned for other great color combinations. All you need to do to get started is go to www.pinterest.com and Request an Invite. It’s free! It’ll take about a day to get your invitation to join and create an account. Then, send us an email (quiltexp@cableone.net) to add you to our color challenges, and we’ll make you a collaborator on all our color story boards so you can pin your ideas! Many of you are in our popular StashBusters club and meet with us at the shop once a month to get our latest Quilt Expressions pattern, as well as show-and-tell the quilts that you’ve made from our patterns. But what you may not realize is we also have a fun crowd of people who participate in StashBusters from afar! We ship patterns to our “global” group once a month and email them a color photo of the sample. To keep it fun, we even send out door prizes to a few lucky winners. 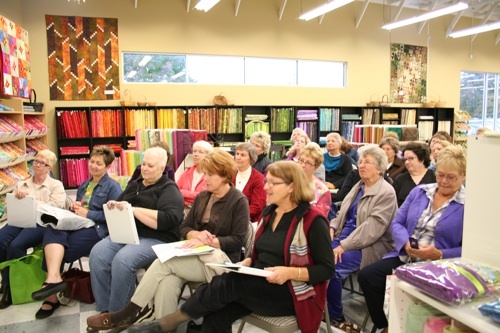 Our local group hearing about the latest pattern design. Since one of our favorite aspects of StashBusters is seeing each pattern in all the creative colorways you put together, we encourage our global group to send photos of their finished projects, too. Jenny Satterthwait, a former local girl now living in Colorado, has kept with us by joining our global group. We were delighted to receive an email from her this month with several of her completed projects. We are excited to share her work with you here! Made from our Fit & Trim pattern by Jenny. Love the variation in color! Here's the same pattern by one of our local ladies. What a different look when you use a print for the background fabric rather than a solid white and don't add borders! Another of Jenny's from one of last year's StashBusters patterns. Jenny also made our Seeds of Time pattern. Doesn't it look striking on the bed? 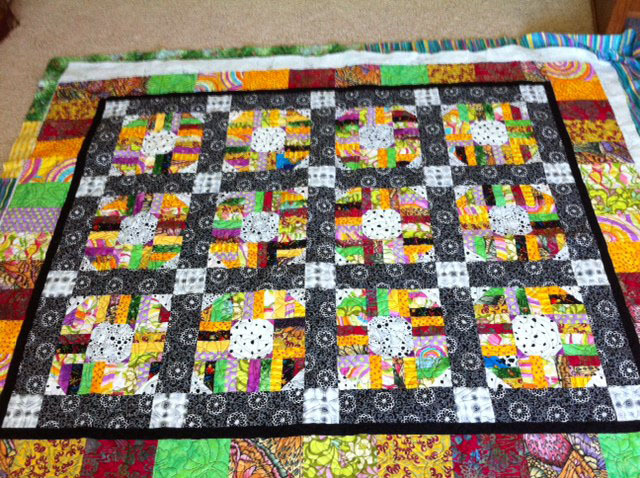 Jenny also shared this bright quilt she made from a Bali Pop. Wow! If you’re interested in joining our global StashBusters club, check out our website to sign up. We’d love to see what you come up with! Okay, crafty ladies. The season of giving is upon us and it’s our time to shine. Whether you’re new to the sewing world or a seasoned veteran, you can impress your family, friends, neighbors and coworkers with your unique, thoughtful, one-of-a-kind presents. And we’re here to help for any of you with a little gifter’s-block. Stuck on what to give your husband, uncle or long-lost cousin? Are your friends’ closets already bursting with your fabulous quilts and looking for something different this year? Starting next week the Quilt Expressions Blog is getting creative and bringing you the 20 Days of Christmas Gift Ideas. We’ll throw out one project idea every weekday so you’ll have your gift making done in no time. But first, we have to ask. What are you making this holiday season? What are your gift ideas? And here’s the fun part — a contest. So, our blogger friends, comment here with your holiday gift idea and our panel of Quilt Expressions experts will pick our favorite project to win a Fruitcake layer cake by Basic Grey for Moda Fabrics. We’ll pick our winner on the morning of December 15th, so don’t delay! Best gift idea wins the prize! Stashbusters! Stash…what? BUSTERS. 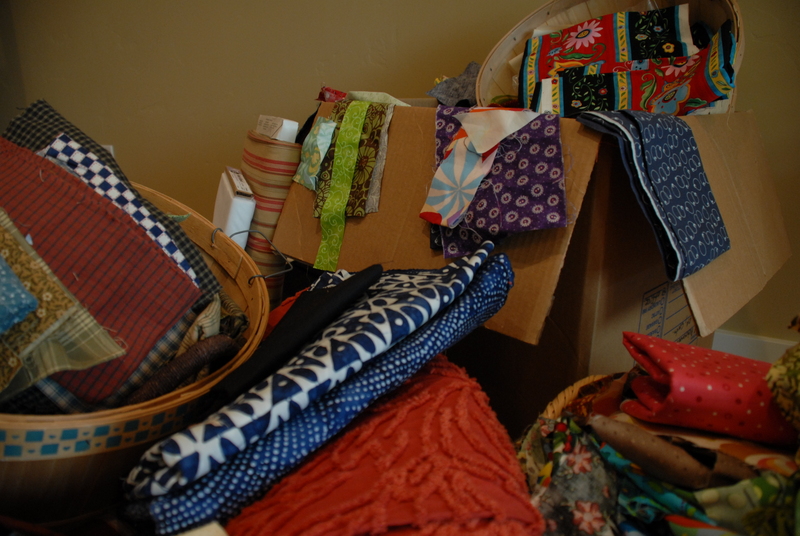 You’re not a quilter until you have a box, closet, or storage shed full of fabric that you have no immediate use for. Maybe we all have a bit of a hoarding problem. Let’s face it, you don’t need that yard of novelty fabric you’ve been “saving” for a special project for the past twenty years. It’s time to let go and make room for all the new pretty fabric that’s out there. And that’s where Stashbusters comes in. We’ve created a simple 12-step program that will help you use up that coveted stash in just one year. Don’t worry though, you’re not alone! We have mobs of women joining us every month. Every month we give you a great new pattern. The idea — make a quilt using what you’ve got already. We meet the fourth Wednesday of the month, as well as the following Saturday. Pick your day and sign up. Show up at the shop with your Stashbusters binder. Eat some cookies. We hand out the latest pattern, give away door prizes, and do show-and-tell of quilts from last month’s pattern. Stand-up comedy. Wellll, not quite. Karen and Della are a punchy duo and always manage to get a few laughs out of the group. Girls just wanna have fun! Coupons? Will there be coupons?! Yes! 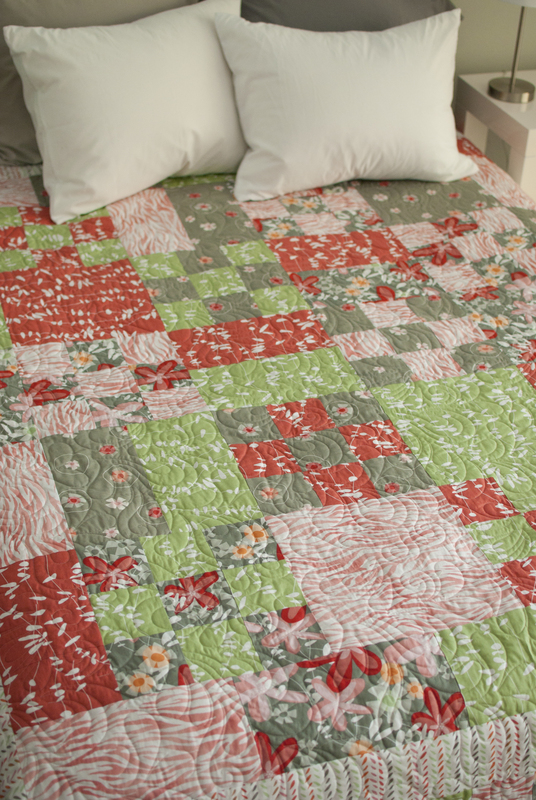 Show your quilt to the group and get a 15% off coupon to use on regular priced merchandise. 12 months is only $45 — a lot cheaper than therapy. Here’s a look at last week’s Stashbusters event. The group waits in anticipation for a door prize. Here's October's pattern, called "Play Date." Can you guess who picked the colors? I'll give you a clue -- Karen says lime green is one of her neutrals. Can't wait to see what the group comes up for this one.